Home > Day Operations > Adenoids: Why Are They Removed? 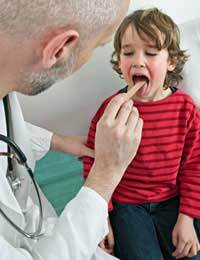 Fifty years ago it was quite common for a child to have his or her tonsils and also adenoids removed. Both are glands in the throat and are easily accessible and the trend in surgery was to remove them when a child was experiencing regular sore throats and throat infections. These were more common before the 1940s, as this was the time when antibiotics had not yet been fully developed and were not widely available. The tonsils are the two pink structures that you can see at the back of the throat when you look in the mirror. One is often bigger than the other and children usually have much bigger tonsils than adults. Having tonsils that are very visible does not mean they are infected or inflamed – if you feel well, they are probably normally like that. The adenoids can’t be seen as they are much higher up at the back of the throat, inside the top of the sinus cavity. They are quite close to the Eustachian tube, which connects the inner ear with the sinuses, and having enlarged adenoids can block this tube, causing glue ear and ear ache. Both sets of glands are full of cells of the immune system and they are strategically positioned to help the body fight of bacteria and viruses that enter the body through the mouth and nose. Although adenoids and tonsils are removed much less often now, there is sometimes justification for carrying out the operation. Adenoids normally enlarge just after birth and can carry on growing until a child is about 7 years old. After that they tend to shrink and rarely cause problems in adults. Children of between 5 and 10 are the most likely to need an operation to remove adenoids. If a child has swollen and inflamed adenoids, they often have a completely blocked nose and tend to always breathe through their mouth. This can make their throat sore and dry. At night, enlarged adenoids cause snoring and can lead to a disturbed night’s sleep. If they become infected regularly, this infection can affect the middle ear, causing ear pain and glue ear, which may need grommet insertion to sort out. A child who has these symptoms and who is tired and irritable as a result and who has obvious difficulty breathing through their nose is a good candidate for an adenoid removal operation. The adenoids in children can also become enlarged because they have an allergy to an air borne allergen. This can be pollen and can become part of the symptoms of their bouts of hay fever, or it can occur all year round. In the latter case, it is likely that the allergen involved in something in the home such as cat or dog dander, or dust mite faeces. The adenoids are removed with a general anaesthetic, so there is always a risk but the operation is a fairly routine one. Afterwards there is also a small risk that the roof of the palate will not heal immediately, and will result in a nasally tone to the child’s voice for the next few weeks or even months. Occasionally a child who has had an operation to remove their adenoids will need speech therapy for a while to bring their speech back to the normal stage of development.